This Canadian six piece seem to be popular on the US festival scene and even a cursory listen to ‘Rattlesnake’ will tell you why. The songs have a danceable quality to them while singer Simon Ward uses the popular Nashville pop trick of autotune from time to time. Add to that a kitchen sink full of massed vocals, crashing percussion and simplistic sing along choruses and you have a party band but what you don’t have is, in any sense, a country, folk or, God forbid, an Americana band. 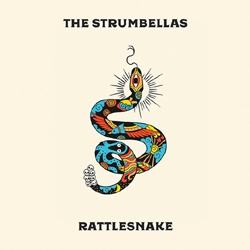 Apparently, The Strumbrellas were more folky in their earlier days, compared with the likes of Mumford & Sons, but on ‘Rattlesnake’ they’ve ditched just about anything which smells remotely of authenticity. For example, the opening of ‘We All Need Someone’ features Ward singing, over a strummed acoustic guitar, “The houses caught fire, caught fire in the field. And the light was astounding, astounding I guess.” Promising, this reviewer thought, but then a ponderous arrangement kicks in along with an early chorus, “We all need someone to love and to hold, we all need shelter to keep us from the cold…” It goes on but we’ll skip the details. Most of the songs follow a similar formula although they do tackle it from different directions. There’s some bro country inclined stuff on ‘I’ll Wait’ while ‘Running Scared (Desert Song)’ is a brisk stride into horn driven melodrama with some hippie ideals thrown in. The last three songs actually tone down the party mood with, ironically, the first of them titled ‘The Party’. Here Ward is in melancholy mood and sounds not too dissimilar from Ryan Adams (if we’re still allowed to mention him). ‘High’ is a bit of a tightrope walk as much of it is a finely attuned harmonic pop folk number recalling Susto but it eventually dissolves into more stadium pleasing choruses. The closing ‘All My Life’ suffers a similar fate with a pseudo Beatles like chorus hammering the point across. Slight as they are, any redemptive qualities in the closing numbers are lost in the overall urge ‘Rattlesnake’ has to entertain. Ultimately this is candyfloss for the ears and it’s unlikely that it will appeal to many readers of Americana UK.